ASSETS client and participant in the third annual Great Social Enterprise Pitch, Luis Miranda of BootCamp900, is making news! 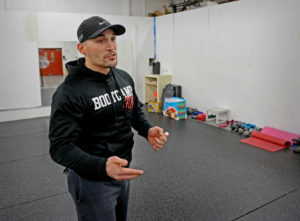 If money was his only goal, Luis A. Miranda Jr. said, he wouldn’t have chosen southeast Lancaster city as the starting place for the fitness program he calls BootCamp900. But the 31-year-old, who was born and raised here, saw a need and felt called to address it. Since 2012, the part-time business gained momentum. This spring, at the urging of Fran Rodriguez — whose Latino Empowerment Project he graduated from — Miranda entered Lancaster’s third annual Great Social Enterprise Pitch and won second place. He still has a day job at Community Action Partnership of Lancaster County, but hopes to expand BootCamp900 and hire its first employee in 2017. How much did you win through the pitch? I won $5,000 cash, was chosen as “crowd favorite,” and received $6,775 in pro-bono services (such as marketing and branding packages, legal services and accounting help). Also, during the crowdfunding phase of the pitch, I was able to raise over $6,000 from the Lancaster community. Even more important, through this experience, the exposure I received and my growth as a person and a businessman, were huge. I do not think there can be a dollar figure attached to that! What’s the most important thing you learned through the pitch program? I learned that as a society we value profitability above everything else, but many times the biggest reward is serving others with our gifts and services, and profits simply follow. Socially responsible businesses flourish now more than ever as we seek greater meaning of life and our impact in a world that means more than money. What does the name BootCamp900 mean? BootCamp comes from the intensity of the training, very similar to a bootcamp. The 900 comes from the fact that if done correctly, the movements and intense training will help participants burn up to 900 calories within the hour. Your pitch noted that you were in prison as a teen. Was it hard deciding whether to mention that? The hardest part was determining whether that was going to create a stigma in the mind of the audience, wondering if people would automatically reject me and the venture. That was an experience in my life that I cannot take back, and that I have learned from and have grown from tremendously. I decided that regardless of how people reacted, I would prefer to be honest and live in the truth of who I am based on my experiences and life journey. I would not let that experience define me any longer, but I will let it help others, therefore I had to mention it. How did the pitch change your BootCamp900 strategy? My original strategy was to focus on creating affordable access to health and wellness in the Southeast side of Lancaster City. I also hoped to help the youth that found themselves in the same position I found myself at the age of 17 by providing them a safe haven to learn life’s critical skills through a health and wellness platform. As part of the pitch process, and the individuals that helped make this program successful, I was exposed to more opportunities for BootCamp900 to be an even greater social venture. I learned that you cannot do everything, but what you do choose to do, you must do well and with purpose. My strategy grew from not just providing opportunities to one vulnerable population — youth — but now expanding the opportunity to previously incarcerated individuals. What did you do before starting BootCamp900? I worked at several jobs including a foundry, warehouses, etc. But I knew where my passion was all along, and that was health and wellness. What’s the hardest decision you’ve faced with starting BootCamp900? As an entrepreneur, the hardest thing is to believe in yourself when no one believes in you or your idea. That is the hardest decision; will I give this up now or push through this tough time?